Genuine Osaka’s Yakiniku recipe, served with premium meat and Osaka sauce. Another delectable cuisine from Oishi. “Nikuya Japanese Barbeque Buffet” is offered in Osaka’s Yakiniku (grilled meat) recipe. The meat is prepared over an odorless and smokeless charcoal fire, for both buffet and à la carte. Superb ingredients are selected ranging from imported beef, fresh mussels from New Zealand, the best type of salmon from Norway, fresh shrimps, first-rate pork blade shoulder, Kurobuta black hog, quality bacon, and many more over 50 varieties. Appetizers, sushi, salad, fruits, assorted ice cream flavors, and a wide range of drinks are also provided. Distinguished savory with Osaka’s original sauce recipe, a blend of Yakiniku sauce and Nikuya sauce. Genuinely taste the originality that is meticulously cooked and perfectly suited for grilled meat. 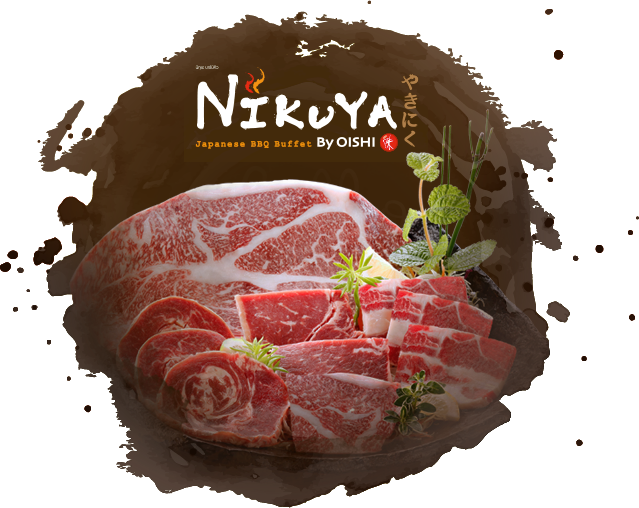 Nikuya Japanese Barbeque Buffet, a paradise for grilled meat lovers. At Nikuya, apart from À la carte dishes, we also cater for you with a selection of buffet sets. *The above prices do not include drink refills which additionally cost 39 baht++. ⌚ You can enjoy for 2 hours.